This is used to import data from sources outside of the Lading Manager. PLEASE BACK UP YOUR FILES BEFORE IMPORTING ANY DATA!!! Import data MUST be in the format of a comma-separated-value text file (CSV). The file name may be anything you wish, but a file extension of "txt" or "csv" is recommended. Before data may be imported, you must first establish a definition of how the data is laid out in the CSV file, and where the CSV file exists. The entire list of import definitions is displayed on the left side of the screen. This list may be sorted by either column. (The "File" types are: 0 for BOL, 1 for Carriers, 2 for Consignees, 3 for Origins, and 4 for Predefined Carrier Information.) Click on the column title to reorder the list by that column. Definition information is edited on the right side of the screen. Press the Add button to add a new import definition. A new definition will be established with "New" as its Name. The name is about all you have to tell one import definition from another. Currently, only CSV or TXT file types are supported. Contact Support if you need assistance. The data fields in the file to be imported must be separated by either a comma ( , ), a semi-colon ( ; ), or a tab character. Commas are the most common delimiter character. Fields that have embedded delimiter characters MUST be enclosed in either single quotation marks ( ' ) or double quotation marks ( " ). Sample import files can be found later in this topic. Some files may have field titles in the first line. If so, please indicate Yes that there is a header present. The import program will ignore this line completely. All of the fields that are available to be imported are listed in the large box on the right side of the screen. The Import Definition box is where you will define the exact layout of the data file that you are importing. If you have a field in your data file that does not have a corresponding import definition field, do not worry, as you may define to "skip" any field that you wish. Fields are added to the Import Definition box by either double clicking on the field, or by clicking on the field and pressing the button. Fields are always added AFTER the field that is highlighted in the Import Definition box. Fields added may be either numbered or lettered (like Microsoft Excel columns). Choose your preference via the Excel Column Style checkbox at the top of the screen. To skip a field in the import file, press the button to insert a skip field indicator. The skip field indicator will display as an "X" in the import definition. You may define as many skip fields as necessary. Fields may be moved up or down in the Import Definition box. Use the button to remove a field from the definition. Use the Locate file to be Imported button to define where the import file is located. This information will be remembered each time that the import definition is used and will be displayed under the button. It is HIGHLY RECOMMENDED that each import be tested before it is applied. Press the Test Import button to see what how the data would be applied. The results from the test will be displayed and you may print them if you wish. Before importing data, you need to understand how import data is applied. Each of the files that you may import into is kept in order by a "key" field. For example, the Origins file uses an origin number for this purpose. Each key field must be unique in order to keep the data records separated. When you import, the program needs to determine if the information you are providing is for a brand new record, or if it is information to update an existing record. For these files, the program looks to see if you provided the "key" to tell the program what record is to be added or updated. If you do not supply this key, then the program will determine if the record already exists based solely on name and postal code (if provided). The program assumes that it is unlikely to have two records with the same name in the same postal code. Using this logic allows you to re-import an entire file from your other system, without having to worry about creating duplicate entries in the Lading Manager. If the import program is determining the "key" to the file for you, this key will be created from the first letter of the name (or description) field, followed by a sequential number. Importing a bill of lading is a bit different from the other import types. This is mainly because you will most likely import many records per bill (for the Customer Order Information and Carrier Information areas). You MUST specify a BOL Lading Number on each record to be imported. This number is to be the same number for all records that belong to the same bill. The BOL Lading Number will not be printed on the bill; the program will use the next number in the BOL numbering scheme. Importing a bill goes through a two step process. The first pass parses (reads) the import data and creates a temporary file with that data. The second pass will build the bill of lading record. It is the second pass that will actually add the bill of lading record to the file. The second pass goes through many of the same processes in which you would manually add a bill, and more. Other files may be updated as a result of the data that is provided in the import file. When the new bill is created, it will initially be assigned the default origin that is specified on the defaults screen. If you specify a BOL Origin Number that is on file, then that origin will be used. Any additional Origin (Shipper) fields provided will be used to update this origin. If you provide a BOL Origin Number and other Shipper fields, then please provide ALL Shipper fields. If you specify a BOL Origin Number that is not on file, one will be created for you using the Shipper fields that you provided. If NO BOL Origin Number is provided, but Shipper fields are provided, the program will see if the BOL Shipper Name and BOL Shipper Postal Code are in the Origins table. If so, it will be updated. If not, then a new entry will be made into the Origins table with the Shipper fields you provided. The key (Origin Number) will be constructed for you, using the first letter of the BOL Shipper Name followed by a sequential number. When the new bill is created, no default consignee will be assigned. If you specify a BOL Consignee Number that is on file, then that consignee will be used. Any additional Consignee fields provided will be used to update this consignee. 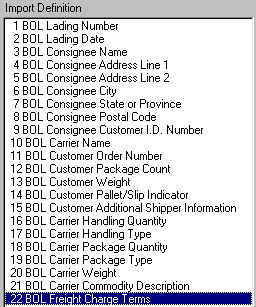 If you provide a BOL Consignee Number and other Consignee fields, then please provide ALL Consignee fields. If you specify a BOL Consignee Number that is not on file, one will be created for you using the Consignee fields that you provided. If NO BOL Consignee Number is provided, but Consignee fields are provided, the program will see if the BOL Consignee Name and BOL Consignee Postal Code are in the Cons table. If so, it will be updated. If not, then a new entry will be made into the Cons table with the Consignee fields you provided. The key (Consignee Number) will be constructed for you, using the first letter of the BOL Consignee Name followed by a sequential number. When the new bill is created, no default carrier will be assigned. If you specify a BOL Carrier Number that is on file, then that carrier will be used. Any additional Carrier fields provided (BOL Carrier Name, BOL Carrier SCAC I.D., and BOL Carrier NMFC Indicator) will be used to update this carrier. If you provide a BOL Carrier Number and other Carrier fields (as listed previously), then please provide ALL Carrier fields. If you specify a BOL Carrier Number that is not on file, one will be created for you using the Carrier fields that you provided. If NO BOL Carrier Number is provided, but Carrier fields are provided, the program will see if the BOL Carrier Name is in the Carriers table. If so, it will be updated. If not, then a new entry will be made into the Carriers table with the Carrier fields you provided. The key (Carrier Number) will be constructed for you, using the first letter of the BOL Carrier Name followed by a sequential number. If you provide BOL Carrier Handling Type, BOL Carrier Package Type, BOL Carrier Commodity Description, BOL LTL NMFC Number, or BOL LTL Class fields, then their corresponding lookup tables will be updated with any new information not already on file. There are some special fields that are input differently that what you would expect. This section will list those fields along with how to import data into them. For the above fields, use 1 for "True" and 0 for "False." BOL Freight Charge Terms Use 0 for "Collect," 1 for "Prepaid," and 2 for "3rd Party." BOL Lading COD Fee Terms Use 0 for "Collect" and 1 for "Prepaid." "Big Truck Parts","1122 E. River Drive","Suite 100","San Antonio","TX","58995"
"Joe's Pizza","244 Main St., P.O. Box 40","","Topeka","KS","69942-1205"
You do not need to wrap text fields with quotes. Here is the same data with quotes only where they would be required. As a result, two records will be imported. Assuming that the Consignee file was empty, the first record would be assigned Consignee Number "B000000001" and record number two would get "J000000001." This example adds a header record and a couple of fields that are not to be imported. As a result, two records will be imported. Assuming that the records were not already in the Carriers file, the first record would be assigned Carrier Number "B000000001" and record number two would get "M000000001." You can reimport data using the same layout over and over again. You can even use the import to update existing records. The import program would look to see if "Mike's Hauling" with postal code "61240" is in the Carriers file already. It would find it, and instead of adding a new record, it would update the existing record with all of the data provided. 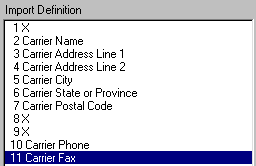 The result of this example would merely add the fax number. Importing BOLs must be done with forethought and care. Any consignee, origin, or carrier information that is supplied in the data will be added or updated to the appropriate files. It is always recommended to back up the files before importing any data. This example shows a basic bill of lading import. The first field is the BOL Lading Number and is required to be on each record, as it ties the two records to ONE bill of lading. The number supplied ("10" in this case) is not going to become the bill number; it is simply used to tell the import program that these two records belong together. It does not matter which of the two formats is used. Both result in one BOL with two Customer Order Information records and one Carrier Information record. To continue with explaining the results, the date "07/25/2003" is provided as the bill date. Dates must be entered as mm/dd/yyyy. If you do not supply a date, today's date will be used. In fact, all of the same defaults are applied when added a BOL via import as they would be when manually adding new bills. Notice that the import data does not specify an origin. If your default information specifies that the "Home" origin is to be used for new bills, then that is what would be assigned. "Joe's Pizza" was input as the consignee with its full address. The import program will attempt to look up "Joe's Pizza" at postal code "69942-1205." If it is found, then that consignee's information will be updated with the information provided. If not found, a new "J00000001" record will be added with this information. As stated in the "How Import Data is Applied" section above, if you specify any part of the consignee you must provide all of the consignee fields. "PO 1442987" was input as the BOL Consignee Customer I.D. Number. "Mike's Hauling" was input as the BOL Carrier Name. The next five fields represent data for the Customer Order Information records. "12-0001" is the BOL Customer Order Number, "5" is the BOL Customer Package Count, "25" is the BOL Customer Weight, "0" or "False" (or "No") is the BOL Customer Pallet/Slip Indicator, and the BOL Customer Additional Shipper Information is blank. On record number two, the same five fields are provided resulting in a second Customer Order Information record to be written. The next six fields represent data for the Carrier Information records. "1" is the BOL Carrier Handling Quantity, "plts" is the BOL Carrier Handling Type, "15" is the BOL Carrier Package Quantity, "ctns" is the BOL Carrier Package Type, "145" is the BOL Carrier Weight, and "Pizza Sauce in Bulk" is the BOL Carrier Commodity Description. There is no data on record number two for the Carrier Information so only one record would be written for this BOL.